Google and AsusTek Computer have teamed up to build an entry-level, seven-inch tablet to be released sometime this May or June, according to DigiTimes. 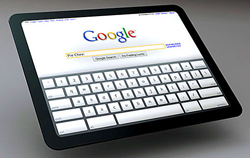 Do you think a Google tablet will be successful? Share your thoughts below. While the Google tablet isn’t going to offer the same power or resolution as the Apple tablet, it is expected to compete with Apple by price. It should be a bit more powerful than the Kindle Fire while costing the same or less, with a sub-$200 price range. With this price, other tablet manufacturers may drop their prices to compete. Acer and Lenovo’s tablets are selling for about $279 and Samsung’s 16GB seven-inch Galaxy Tab is $328. Yet speculations of a “price war” are probably premature. Price wars tend to occur when manufacturers compete in a race to the bottom. Entry level tablets might be cheap, but if they under-perform, people will start to lose interest – and there will always be plenty of people ready to pay more for something that packs a little more punch. A Google Tablet by Spring?